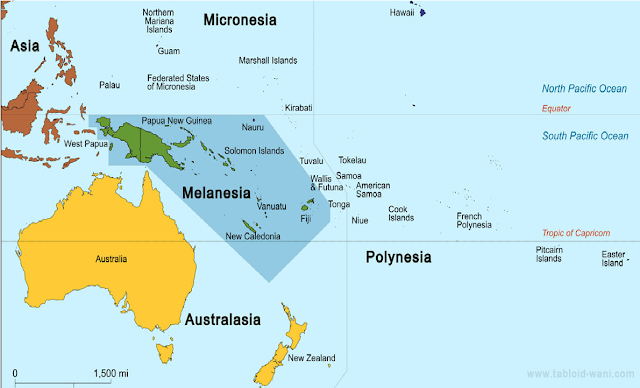 There are several benefits for Indonesia in joining the Melanesian Spearhead Group (MSG) and the Pacific Island Forum (PIF), namely: Indonesia is a country with the highest number of Melanesian races compared to countries located in the South Pacific region; Indonesia is geographically a close neighbor of the Melanesian countries, so it is possible for Indonesia to forge closer ties; Indonesia’s economic level compared to countries in the South Pacific is exceptionally far, so it is an opportunity for Indonesia to provide capacity building assistance to these countries. Indonesia decided to join the MSG and the PIF because of Indonesia’s increasing diplomatic capacity through soft power as a driving force in the South Pacific region. Indonesia’s foreign policy is inseparable from the influence of strategic geographic positioning factors, i.e., being in a cross position between two continents and two oceans; the potential of natural and human resources and its demographic order; as well as a socio-political system that greatly influences attitudes, worldviews, and ways of positioning itself on the international stage. Indonesia’s involvement in the MSG and the PIF are based on several factors as a basis of consideration. First is the socio-cultural factor. This is evident from the similarities of Melanesian races present in Indonesia and in the Pacific. The second is the geographical factor, and in addition to ASEAN, Indonesia also has similar neighbors in the eastern part of Indonesia. Next are the economic and political factors where Indonesia is currently spreading its seeds to harvest its results in the future. When viewed from the economic side, the level of Indonesia’s economy is clearly higher than other member countries. Therefore, Indonesia is still more in providing than in receiving. Politically, Indonesia wants to be an influential country in the South Pacific region as it is influential in Southeast Asia. By joining the MSG and the PIF, the Indonesian government sees several factors that can be developed and can also be beneficial for Indonesia in the future, especially in terms of cooperation in the economic field, given that Indonesia’s trade value with MSG and PIF countries is quite huge. This means that the involvement of Indonesia as a member of the MSG and the PIF can help improve the economy of the people in the Pacific countries. Indonesia’s membership in the MSG will also provide an advantage in building better diplomatic relations. The government can easily provide better understanding of Indonesia’s enormous concern for the Melanesian society, especially in Papua and West Papua. Everyone has realized the fact that Indonesians in Papua are in good condition, and the community carries out its activities in a normal and conducive way. The wheels of governance and government policies are running smoothly. Therefore, as a member of the MSG and the PIF, Indonesia is expected to create closer and better relations to open communication and better understanding of developments in the regions of Papua and West Papua. This has been going on according to national plans. In addition, Indonesia’s joining of the MSG will increase the confidence of the international community, especially the Melanesian people, that Indonesia has the ability to manage domestic issues through open and familial dialogue.